Halong Bay is a body water off the Tonkin Gulf located near the North East border with China and covers an approximate area of 579 square miles. Dotted with 1,969 limestone islets rising from the emerald waters and referred to as “Bay of descending dragons”, Halong Bay has been the top attraction of worldwide travelers and holiday makers in Vietnam. With basically two distinctive kinds of rock islands, limestone and schist, this particular area of the Halong Bay archipelago was differentiated between Bai Tu Long Bay (the southeast) and Halong Bay (the southwest). 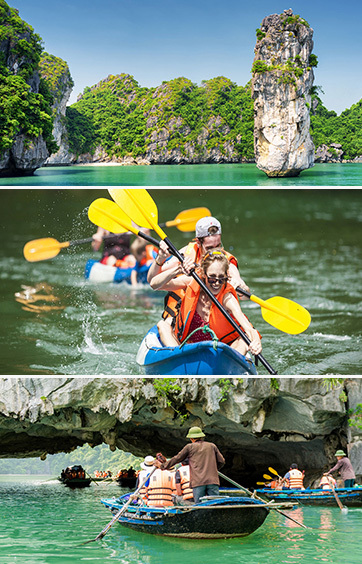 Sculpted into awesome shapes by the wind and weather for millions of years, these islands hide deserted beaches, numerous magnificent caves and hidden lagoons that may only be reached by kayaking through reclining cliffs revealed at the low tides. Ancient legends are passed word of mouth to the younger generations from many years past, since their local forefathers were fighting against Chinese invaders, the Gods designated a family of dragons to help defend the land. That family of dragons descended upon what is now Halong Bay and began spitting out their jewels and jades. Those jewels turned into the islands and islets dotting the bay, linking together to form barriers against the invaders. That pride was made evident one more time in the year 1288, when General Tran Hung Dao stopped Mongol ships from sailing up the nearby BachDang River by entrapping the steel-tipped wooden stakes at high tide, to sink the Mongol Dubhai Khan’s fleet. Far beyond what the legend says, Halong Bay features beautiful geographic works of art as over half of the islands were given their names exactly from their unusual shapes and by human imagination. These shapes can magically be changed by the angles of light, directions of view, and especially when they are silhouetted against the sun. On the boundary of this archipelago, there are two bigger islands with permanent inhabitants. They are Tuan Chau island and Cat Ba National Park. Both of them are well equipped with tourism facilities such as hotels, restaurants and beach resorts. Though declared to be a World Natural Heritage by late December 1994, Halong Bay was already well known to outsiders from the movie “Indochine”, starring Catherine Deneuve in 1991. Splendid rocks emerging from the emerald waters, serene sky, mountains touching mountains, Halong Bay has always been a dream for any naturalist and cruise lover. Born and raised in this coastal town of Halong, my childhood was leisurely bound to spending after-school hours with friends and searching for shells left on the beaches after the waves hit its shores. I never suspected that one day my hometown would become so famous among world travelers and never even imagined that I would be so deeply involved in the travel industry, especially within my beloved Halong Bay. My love of this area has inspired me to recall and to want to share with you the remarkable milestones that I have witnessed. From early to mid 80’s, – Halong was mostly a place where State’s agencies sent their loyal staffs, factory workers, cooperative members, etc for their annual holidays on this pristine beach. A few foreigners could be seen at that time and, as a matter of fact, they were from the big-brother countries to Vietnam. As children, we were both scared and curious about their appearance since they were so different from our parents and other Vietnamese people we knew. Surely you get my point that countries such as the Soviet Union, Poland, East Germany and Czech & Slovakia were among those visitors. And compare to what you are going to see now… big big difference. Back then, just a few shaky, torn iron-bodied, double-deck boats like the old fashioned ferries greeted the old day’s holidaymakers of Halong Bay. Mid 80’ to late 1991 – The Eastern block was going through a politically unstable period and finally came to an end. Halong was given back exclusively to the Vietnamese weekend beach vacationers who loved to gather with their families and make full use of the opportunity that the State’s generosity had rewarded them and their families with the summer trip. Though annually, they had to be hard working during the year to count their turn in. Early 1992 to 1996 – This was a turning point for Vietnam as a whole and for my hometown in particular. Private economic sector was accepted, a modest number of young back-packers set their foot in Vietnam and Halong Bay seemed to be a “must” in their discovery trip. Mentioning this, I don’t mean to discriminate against the senior (but young at heart) travelers. However, sometimes, I believe that if the modern day Halong authorities would consider paying tribute for the development of this tourism industry, some of those fellow back-packers should be the most deserving nominees as their good word of mouth greatly helped. Soon after, some capitalist-oriented locals gradually set their first stone in new businesses and the very first operation was to arrange boat cruises out into the Bay. You could never imagine how little functional the boats were; small converted fishing boats, two long benches along the sides and crippling tables that ran in between, no windows, open sides and no food was available or could only be catered if you ordered way long in advance. Sometimes the boat would have mechanical problems and stop in the middle of the Bay. The captain, who also served as a mechanic, had to leave his steering wheel for a while to fix the problem down in the machine compartment. Whoops, what a scary thing! Late 1996 was the time that rooted my current profession as services provider. Back then, a tour guide who could speak English to group of travelers on board was often needed; I played several roles as cook’s assistant, captain’s assistant and, sometimes, all three in one. We were all wet behind the ears in the industry at that time but we had a great love and passion for our job. Early 1997 to late 2000 – Green lighted with the firm recognition of the private sector from the State and along with the surge of Vietnam’s economy, which was barely impacted by the neighboring economic crisis, those boat owners, most of them in family business, were on a race to build new and bigger junk boats with double decks, more facilities, and more staff to serve day trip cruise in Halong. All had a simple goal to earn faster profits. With a growing mind of a tour guide, I understood there would soon be a dramatic change, not only in the kind of boat services but also in the Halong urban sprawl that was surely growing fast. It was just a matter of when. It was a time of rapidly growing numbers of Westerners and European visitors. Even the Chinese neighbors were rushing to Halong Bay. I wasn’t sure if I felt bad or good then, but most of my time was given to the job. Early 2001 to late 2004 – It’s been a flourishing time for the Halong Bay tourism industry and for its beneficiaries, including the boat companies, travel companies and their clients. A notable event was witnessed by the launching of LanPhuong Junk, the very first ever that catered the unique concept of an “overnight on board a wooden Junk” in the middle of Halong Bay. That effort was made possible by lobbying the local authorities to convince them there was a real demand from foreign travelers who expected the overnight experience on Halong Bay. It took a little while for the Vietnam-based travel agencies to introduce this new product of cruising the wooden junk. Also, patience was on the part of local competitors who waited to see how successful the LanPhuong’s owners became. Then, the motto “Keeping up with the Joneses” started a new race of building more and more junks in Halong. One could easily see this period was pioneered by Huong Hai company and its competitor, BaiTho. Eric Merlin, a French investor in the service industry, could not stay away from the race, and made as his entry with the old-fashioned steam paddle boat, the Emeraude, which was launched by late 2004. Hard to believe, at that time, there were about 250 boats docked in the quay, with four-fifths accommodating the day cruisers and only the remaining fifth just starting to venture into the overnight operation. At that point, I believed a considerable number of locals would definitely get a job sooner or later. I decided to leave the guide job behind and together with Tim, a best friend of mine, we set up Indochina Voyages travel company that would cover our operation throughout Indochina. But who can forget his homeland? My heart is still in Halong Bay, as always and Halong Junk Cruise booking site was born after. Travelers to Halong Bay today are mostly motivated by the idea of joining in a shared wooden junk, which is never a bad choice, or of chartering the small size but deluxe junk cruises that fully accommodate all family members. Just do a search and select a cruise that fits your style, budget and comfort level and stay relax during your awaited cruise in Halong. I’m sure you will enjoy it, as Halong Bay is always worth the experience. – Early 2005 up to early 2018 – A large number of elegant, luxury junk cruises were built. Service has been carefully oriented to meet the demands of the growing numbers of up-market travelers and all cruiser owners focused on training their crews in the qualifying standards of first-class hotels all over the world. More and more training courses for the staffs were offered in Hanoi, giving top priority to personalized attention, a crucial factor in this perpetual competition among junk company owners. Several new types were introduced, such as Ginger, Bhaya, Indochina Sail, Jasmine, Valentine, Orchid, Treasure and Paradise etc…and at the time I am writing this review, the number of junk cruises in Halong has been escalating to over 600 cruises. Don’t be surprised that the orientation of service has changed. Nowadays four fifth of those are dedicated to overnight service, with only one-fifth left for the day trip cruise. These numbers are not etched in stone as more and more syndicates are looking into the potential of this market, of course, with their smart vision to the visible profits to be found. Thank you for using our site & welcome to our Halong Bay Cruise!